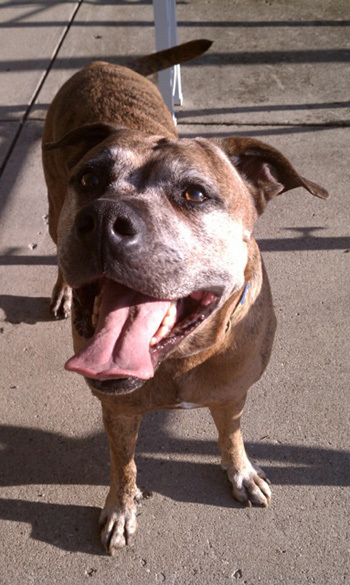 Slaw is a goofy and adorable 10-year-old pit bull and Boxer mix. He’s a 90-pound lap dog who makes noises like a Wookie, enjoys dressing up and watching old Jazzercise videos and chasing flies. We have been together through college graduation, eight moves and three states, and we have driven across the country together – twice. Slaw has been my constant in an ever-changing life – he is my family. Slaw is also the inspiration for the campaign to get United Airlines to remove the breed discrimination from their pet policy. 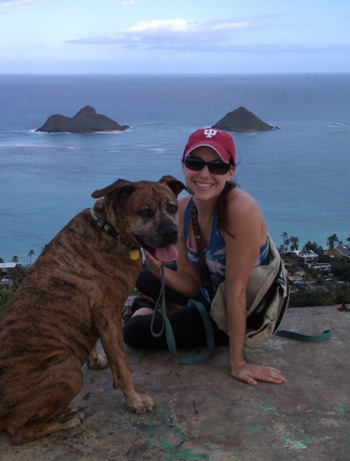 In November 2011, I was making plans to move from Hawaii and learned of a policy that prevented pit bull-type dogs and several breeds from flying on Continental Airlines. At the time, I wrote a letter to Continental and let them know I disagreed with their policy and that I thought it was unfair to responsible dog owners. I debated on lying about his breed, but felt strongly about not supporting the airline and their policy with my money, so I booked our travel on another airline. After United and Continental Airlines merged, United adopted Continental’s PetSafe Program and also their discriminatory breed ban. After telling a few other dog advocates my story, a friend recommended I start a Change.org petition. I was familiar with the social action platform and had signed petitions in the past, but I had never started my own petition. Initially, I hoped to get 1,000 signatures and to at least spread the word. Three months and almost 46,000 signatures later, United Airlines changed their policy and now allows pit bulls and the previously banned breeds to fly! This petition had the support of Change.org campaign organizers, animal advocacy organizations, like Best Friends Animal Society and almost 46,000 individual animal welfare advocates who made their voices heard. This change wouldn’t have happened without the support of many, but I think it’s inspiring that it also started from one person and one petition. We often think, as individuals, we cannot enact change and tend to overlook discriminatory and unfair policies and systems because we think there is nothing we can do. I hope this story proves otherwise. Although we may need the support of many, one person can be the start of positive change. There has been some criticism that United is still unfairly discriminating against particular dogs by requiring reinforced crates for those who were previously banned. I agree that the policy isn’t perfect – ideally airlines would require increased safety measures for all dogs. However, I think the progress and change can still be celebrated. It’s a success because it’s an example of people coming together to create change and because it’s a step in the right direction for pit bulls and responsible dog owners. One day pit bulls will be treated as they should be – like the pets, family members, and dogs that they are! YAY you’re an inspiration to all of us! Thank you for being the reasons I two pitties can fly with us! Score one for fairness! Thank you for your action and for sharing this encouraging story. I am totally thrilled that you were able to turn this around! I was ready to cease and desist on all things United/Continental even though I have been flying with them for years. Since I now have two pitties, I was determined to start flying with an airline that wasn’t so discriminatory! Thanks for your good work on this! Yeah for your story and ALL the work you did! also Yeah to jazzercise!!!! Thanks, everyone, for your encouragement! I was thrilled with the results of this campaign, but couldn’t have done it without so much support. Thank you! Great picture of you and Slaw, by the way.